Residents of the Big Apple could start earning big bucks if an anti-idling bill to award New Yorkers for filming law breakers is approved by the City Council. If adopted, the bill would establish a program that could let New York City residents earn cash rewards in exchange for submitting video evidence of people caught violating the city’s already strict anti-idling laws. 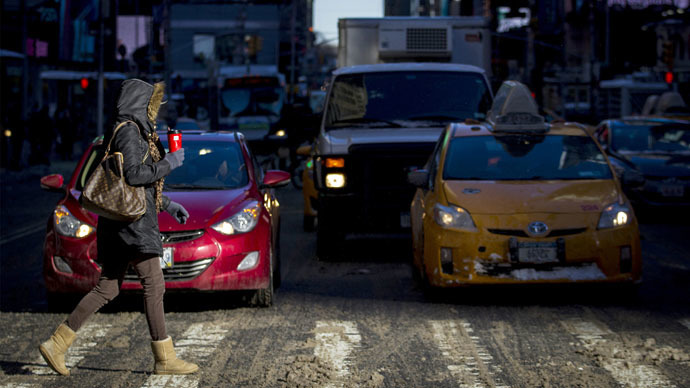 Curbside idling costs drivers in New York City around $28 million a year in wasted fuel, according to a 2009 environmental report, and air pollution is believed by city officials to be a leading factor in an estimated 6 percent of annual deaths. In an effort to clean up the air and put money back into the pockets of New Yorkers, two city council members are unveiling a bill this week aiming to compensate residents willing to help crack down on idling automobiles with increased penalties for law breakers. “This is a real environmental problem and a real public health problem that I know my constituents have been urging me to address,” Councilwoman Helen Rosenthal (D-Manhattan) told local CBS News. She’ll formally announce her bill on Wednesday this week alongside Council member Donovan Richards (D-Queens). The council members still need to garner the support of colleagues before the bill has a chance at becoming law, but if approved it would offer residents up to 50 percent of the fine if they catch someone breaking the city’s idling law on tape and submit the footage to the Department of Environmental Protection. “You can see if the car behind me is still idling, all you would need to do is video tape the license plate and then upload it to the website at DEP and then DEP would issue a summons,” Rosenthal explained to a local CBS News affiliate. Additionally, the bill would keep first-time idling violations punishable by just a warning, but increase penalties for follow-up offenses: second-timers would risk paying upwards of between $350 and $1,500, and subsequent violations within a two-year span would carry fines of between $440 and $2,000. As with the city’s current rules, drivers caught idling their automobiles for more than three minutes — or more than one minute in a school zone — would be eligible for fines. Unlike now, however, not all of those levies would go to the city. According to recent statistics, though, the city hasn’t been issuing all that many citations as of late: the New York Post reported that 325 idling violations were issued by three city agencies combined in 2002, and that number dropped to 209 last year, citing city records. The newspaper reported that, even if the proposal is approved, the DEP would still have to determine the exact cut that will be offered to videographers. According to the paper though, New Yorkers would nevertheless stand a chance at making thousands of dollars by doing their part to cut down on air pollution. If approved by the City Council, the Post reported that the DEP will offer a training program five days a year which New Yorkers could attend to participate in the recording initiative.